Growing flowers or vegetables from seeds is a good way to introduce children to gardening. Decorating a little pot turns this into a fun creative activity too. Decorate the pot by spreading on some glue to the outside and shaking over glitter. As an alternative you could put on stickers instead. 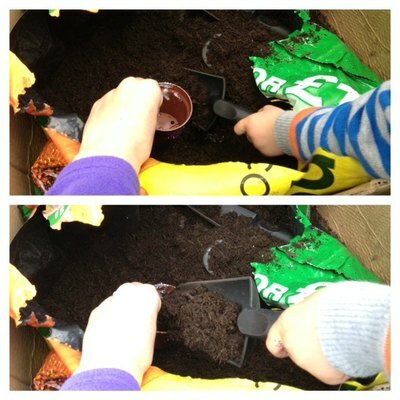 Let your child have fun scooping up compost and filling their little pot. If it gets a bit too full then just take a little compost back out. Just in case the sunflower seed doesn't germinate, it's a good idea to plant two. Let your child stick their finger into the compost making two holes. Drop a sunflower in each hole and fill over with compost. Add a little water and talk about what seeds need to grow into plants. To start they need a little warmth and water and once they appear they will need the sun. Write 'sunflower' on a popsicle stick and stick into the pot. The waiting is the hardest part and my son checked his pot everyday. After a few days and a little bit more water, a tiny shoot and leaf appeared. Once it gets a little bigger we will plant it in the garden and then measure how tall it gets. Once you have a lovely big sunflower with lots of seeds you can save some to plant the next year and give the rest to the birds in winter. My son created this lovely pot and sunflower at a kids activity day where the very fun people at the Oxfordshire Play Association had a stand.